Serviam Girls Academy is a tuition-free, independent Catholic middle school in the Ursuline tradition for young women of all faiths from low-income families. Serviam empowers students to succeed in high school and become leaders who serve their families and the needs of society through a dynamic academic program and the development of the whole person in an atmosphere of respect and responsibility. 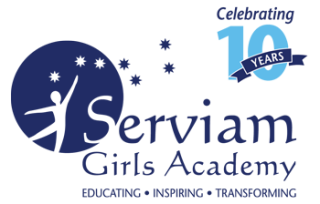 Serviam Girls Academy is part of a 45 year tradition of providing a high quality middle school education to adolescents with great potential but with limited resources. Part of a NativityMiguel network, and steeped in the Ursuline tradition, Serviam was founded on the premise that the community would invest in an education that allows every child the opportunity to reach her full potential. Innovative education demands creative approaches to engage the learner. A Serviam education is characterized by a full 10-hour day, from breakfast through core classes, including daily gym class, to homework hour, clubs and athletics; students are inspired to learn. Recognizing that one’s education does not end simply because the school year is over, Serviam provides a full 10+ month school year, which includes a mandatory four week Summer Program in July. Summer Program helps facilitate community, inspire passion, and bridge potential learning gaps that often occur over a three month-long summer vacation. 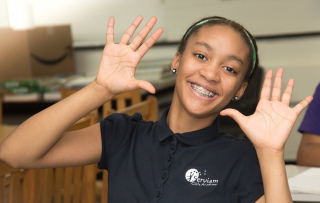 Serviam Girls Academy is the only private, tuition-free school for girls from low-income families in Delaware. Serviam’s mission is to provide a private school, quality education to 60 underserved middle school girls in grades 5-8. Small classes (12-18 students) are intentionally designed to foster a strong, nurturing community and allow for individualized attention. Serviam Girls Academy, committed to ensuring the long-term success of our students, provides a Graduate Support Program designed to lay the foundation for our students to attend and graduate from college preparatory high schools and then colleges. The program also facilitates access to a network of peers and adults that provide them support as they strive to lead successful lives. Let's celebrate ten years of providing an exceptional education to New Castle County’s middle school girls! Dance the night away, meet new people, talk to students and alums, purchase much-needed items for the school; celebrate with us and enjoy an unforgettable evening! Inspired by your abundant support, the Longwood Foundation has generously committed to creating an even stronger future by matching your contribution. Make a multi-year pledge. Join us today!